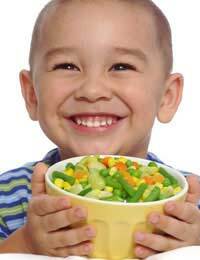 Home > Facts & Figures > Can a Child Eat Too Healthily? In the 1980s, there were concerns about ‘muesli-belt malnutrition’, with children eating too healthy a diet. Though in this case the concerns were overstated, it is still something that parents and carers should think about. Children have different nutritional needs to adults, and cannot just eat a smaller version of an adult’s healthy diet. Because children are still growing, and are generally more active than adults are, they need to eat more fat as part of a healthy diet. Fat supplies energy, and provides essential fatty acids and fat-soluble vitamins that the body needs, as well as being a building block for the nervous system and the brain. Babies and toddlers can have up to 40% of their calories as fat, and children and teenagers up to 35%. However, this does not mean that children should have free access to sweets, cakes, crisps and chocolate (though these are fine as an occasional treat). They should instead get their fat from full fat milk (children under five should not have skimmed milk, and children under two should not have semi-skimmed milk), meat, oily fish, eggs and cheese, as well as from nuts, seeds and avocados. Like adults, children shouldn’t get too much fat from saturated fat (cream, butter, lard, suet) or trans fats (vegetable fats that have been changed chemically to be solid at room temperature, and are used in processed foods such as cakes, pastry and biscuits). Because children have small stomachs, they need a series of small meals and snacks throughout the day, made up of food with a relatively high concentration of calories and nutrients. Though they need a certain amount of fibre to help their digestive systems, too much fibre, such as too much brown rice or wholemeal pasta, and foods with added bran, makes the food too filling, reducing the number of available calories. Too much fibre can stop the absorption of important vitamins and minerals. Though having five a day is very important, too many fruit and vegetables can also make food too filling and too low in calories. Making sure that children drink enough is also important, but remember that water and other drinks are filling, and can stop children eating enough. Though children do need proportionally more calories for their size than adults, keeping an eye on the refined sugar in their diets is a good idea, including avoiding too many sweets, biscuits and cakes (though they are great as occasional treats), having diluted fruit juice or smoothies rather than sweetened fizzy drinks and squashes, reducing added sugar on cereals (and avoiding pre-sweetened cereals), and cutting down on jams and marmalades, or replacing them with low-sugar, high-fruit versions, or fruit spreads made from concentrated fruit juice. Salt is in many processed foods, including cereals and bread, and too much is bad for a child’s health – try looking for lower salt versions of breakfast cereals (these are often lower in sugar too), cutting down on crisps and salted nuts other than as a treat, and avoiding adding salt to food in cooking.